Rome: Italian Prime Minister Silvio Berlusconi has one day left to win over waverers and see off a group of party rebels threatening to bring down his government in a backlash over its failure to adopt reforms to defuse a debt crisis. But even interior minister Roberto Maroni, after hearing of the latest defection in Berlusconi’s PDL party, said the writing seemed to be on the wall. “The latest news leads me to think that the majority no longer exists and that it is useless (for Berlusconi) to be implacable," Maroni, a member of the Northern League, said on a Sunday night talk show. The scandal-ridden 75-year-old media tycoon has defied all calls to step down and is adamant that he can battle on. “We have checked in the last few hours and the numbers are certain, we still have a majority," he told party followers on Sunday. The centre-left opposition quickly dismissed that assertion and said it was preparing a motion of no-confidence in the government that would bring Berlusconi down even if he survives Tuesday’s vote. “Berlusconi is bluffing in a last desperate attempt to save himself. He no longer has a majority in the Chamber," said Dario Franceschini of the main opposition Democratic party. Newspapers have estimated the number of potential defectors at between 20 and 40, which would be more than enough to topple the government, but in previous narrow escapes Berlusconi has proved his powers of last-minute persuasion. He has been meeting and telephoning rebels since he returned from a humiliating international summit in France on Friday which agreed the International Monetary Fund would visit Italy quarterly to check its progress in passing long-delayed reforms. A deputy from his ruling coalition said after meeting Berlusconi that the premier was ready to reward doubters with “well-deserved jobs" in government. 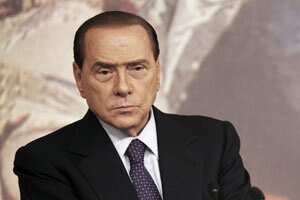 Berlusconi said on Friday defectors would be “betraying the government and the country". Italy has the third biggest economy in the euro zone and its political turmoil and debt worries are seen as a huge threat in the wider crisis facing the continent’s single currency. Uncertainty over the political disarray hit Italian bonds, pushing yields to a record euro-era high over 6.6%. The spread over German bunds, reflecting the risk premium investors place on Italy, also hit a record 480 basis points on Monday morning. Bond prices would recover and the yield spread would fall by a full percentage point if the government should fall, according to a Reuters survey of 10 fund managers, market analysts and strategists last week. Economy minister Giulio Tremonti was forced to deny reports that he had forecast a “catastrophe" on financial markets this week unless Berlusconi stepped down. European Central Bank council member Yves Mersch underscored the high stakes on Sunday, saying that the ECB frequently debates the option of ending its purchases of Italian bonds unless Rome delivers on reforms. Without that bond-buying programme, the run on Italian bonds would probably already have spiralled out of control. Berlusconi on Sunday rejected talk of being succeeded by an unelected technocratic government or a political administration with the backing of all the forces in parliament, saying: “The only alternative to this government would be elections." He also seemed to be having second thoughts over the IMF monitoring, saying the initiative for the visits “came from us and we can withdraw it whenever we want". Commentators say the behind-the-scenes manoeuvres are reminiscent of the so-called “first republic" that ruled Italy for nearly 50 years after World War Two, when new governments were constantly formed and dismantled in parliament by the many factions of the powerful Christian Democrat party. Many centre-right fence-sitters are former Christian Democrats and are being tempted by offers from the small, centrist UDC party to join forces behind a new government with broad cross-party support spanning both centre-right and opposition. These negotiations will go on even if Berlusconi wins Tuesday’s vote to ratify 2010 public accounts, with no let-up in the atmosphere of intrigue and above all uncertainty ahead of more important votes on budget measures due later this month. Lower house speaker Gianfranco Fini, a former ally and now arch-enemy of the prime minister, made the point strongly when he appealed to Berlusconi to resign on Sunday. “The government must understand that it is not credible even if it wins in parliament by a vote, because with a majority of one vote you can survive, but you cannot govern."